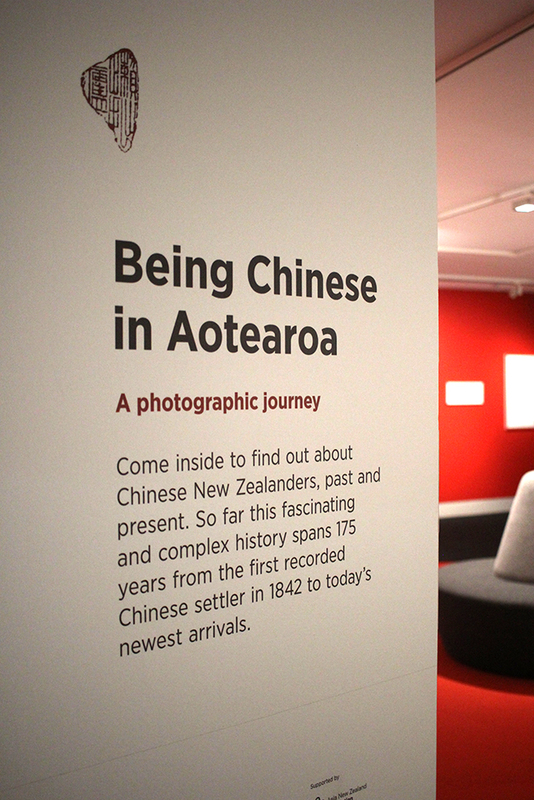 This is the final weekend of the Being Chinese in Aotearoa: A Photographic Exhibition at the Auckland War Memorial Museum; presenting a glimpse of some of the Chinese New Zealanders who’s history spans 175 years in the country. 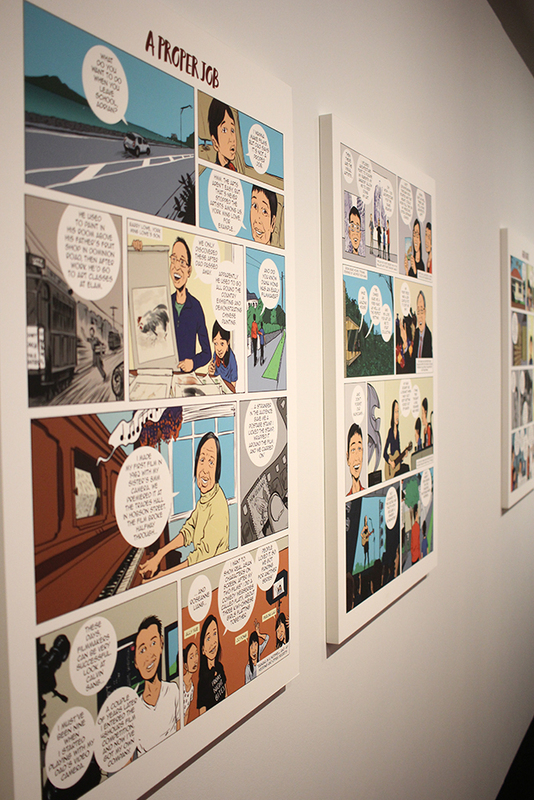 Helene Wong and I produced a series of comic stories to accompany the photographic exhibition. 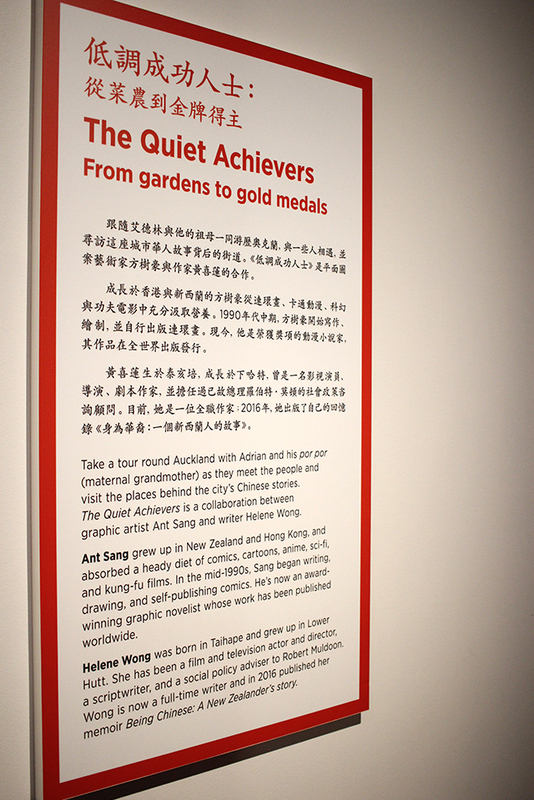 The Quiet Achievers: From Gardens to Gold Medals are a contemporary work, focusing on the surprising and unexpected stories of some of the Chinese New Zealanders who have lived, worked and contributed to Auckland. 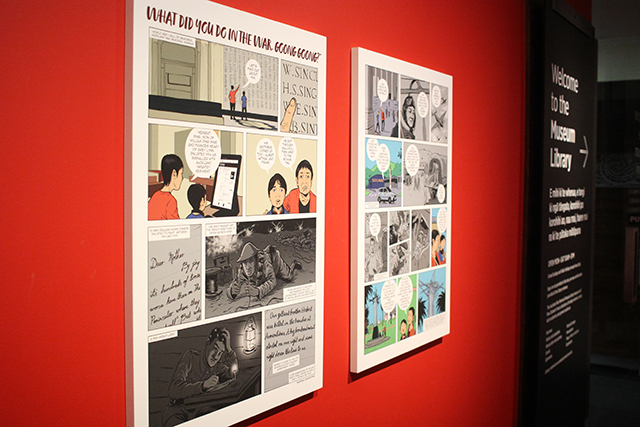 Copies of the comics can be purchased at the Museum Store here. 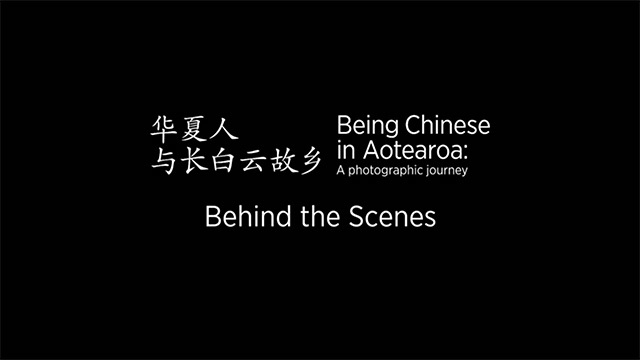 Here’s a cool behind the scenes video of Helene Wong and I, talking about our collaboration for The Quiet Achievers comic we produced for Auckland War Memorial Museum’s Being Chinese in Aotearoa exhibition. It’s on until February 2018, so there’s still heaps of time to catch it if you’re in Auckland. 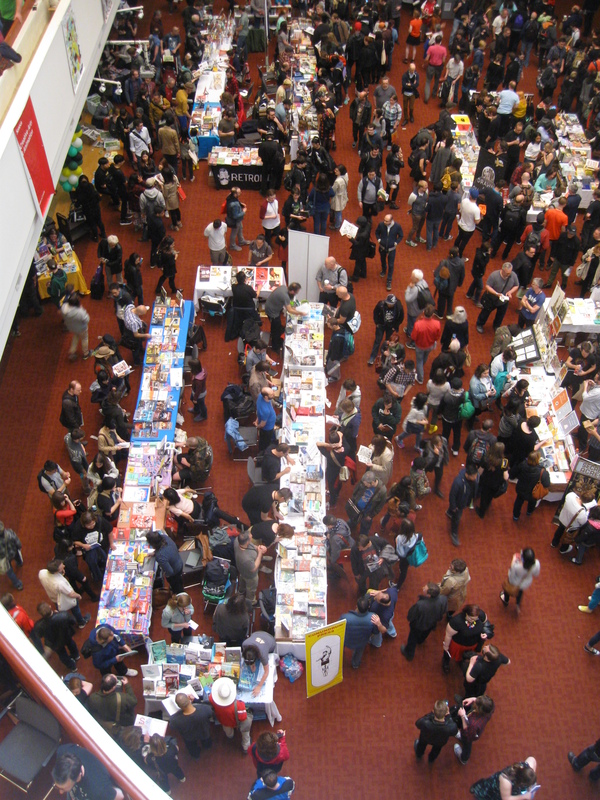 After thirty hours of travelling I arrived in Toronto late Thursday afternoon, took the train and subway to my hotel downtown, dumped my luggage and scrambled across the road to my first event of the Toronto Comics Arts Festival (TCAF) 2016. My publisher, Conundrum Press, was launching two books at the Firkin bar that evening – Garbage by Mathew Reichertz, and The Greatest Comic Book of All Time by Bart Beaty and Benjamin Woo. I arrived a little late but managed to meet the authors and Andy Brown (my publisher) who was celebrating twenty years of Conundrum Press. With local Steam Whistle beer in hand, I was introduced to Anders Lundgren (from the Comics Library in Sweden) a man with an encyclopaedic knowledge of comics and films, and a dry sense of humour to boot. Jetlagged, sleep-deprived and hungry, the remnants of raw broccoli and dip weren’t going to cut it, so I was pleased six of us ended the night at Wow Sushi. Dinner was followed by an unsuccessful search for a local comic book shop, which actually was fine as it was the perfect night for a late stroll through the emptying streets of downtown Toronto. 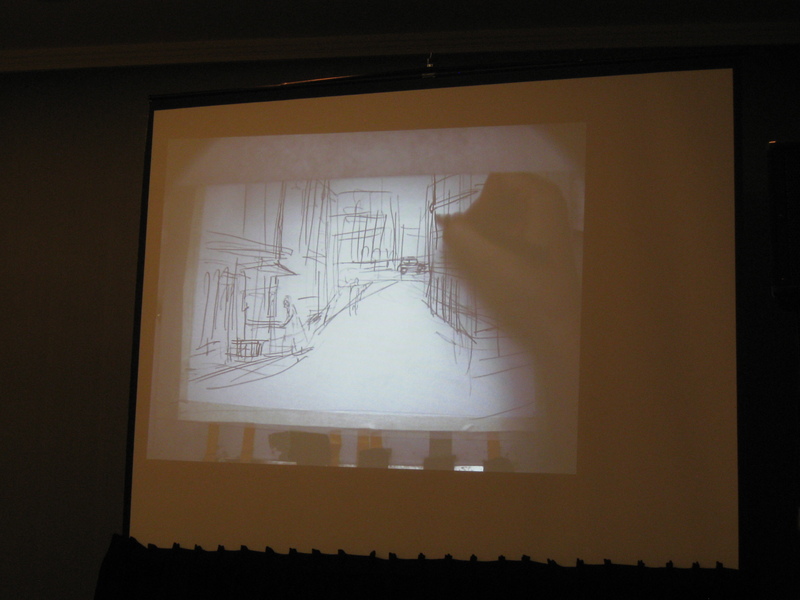 “Drawing as Exploring: A Strong Sense of Place” was a live drawing demonstration by artist Barbara Yelin. She talked about her organic process of getting story ideas through researching places and drawing, letting characters and scenarios spring forth from her studies and sketches . Sometimes ideas come easier while doing something. Anything. So I know what she meant when she told us, “my best inventions come while I draw”. Yelin also showed her techniques for drawing with soft pencil and eraser, and ink wash. I always love seeing other artists at work and watching how she carved light onto her artwork to create highlights and shafts of light, erasing the sketchy pencils beneath, was a great reminder that comic art can be as messy and scratchy as you want it to be. “Defining ‘Comics Editor’” was a fun chat between two colleagues – James Lucas Jones (editor-in-chief at Oni Press) and writer J. Torres. They had a lively discussion about collaboration, when collaborations go bad and gave advice about portfolio submissions (show 6 – 8 pages, different tones, dialogue and action, demonstrate flow and storytelling ability). “The Evolved Form of Webcomics” was of interest to me because I’m an idiot when it comes to anything slightly technological. Nicole Chartrand and Mildred Louis gave a quick (but super informative) summary of the history of webcomics – covering the very first webcomics in the 1980s, landmark webcomics and technological advances (e.g. animation, interactivity, infinite scrolling) which helped webcomics evolve from a primitive, humour-based medium to the sophisticated long-form storytelling medium it is today. They also discussed how the popularity of the internet was a “huge turning point” in regards to the involvement of women and POC as creators. 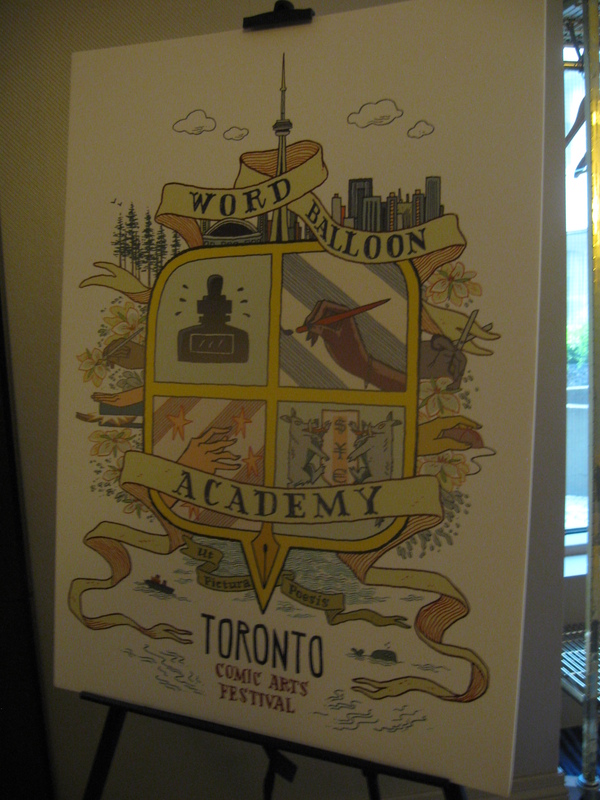 In the afternoon I attended the TCAF Kickoff event “The Graphic Novel Revolution”. It was a great panel discussion featuring Conundrum Press Publisher Andy Brown, First Second Publisher Mark Siegel, Koyama Press publisher Anne Koyama, author Brian K. Vaughan (Saga, Y: The Last Man) interviewed by comics journalist and writer Heidi MacDonald (Comicsbeat.com). It was interesting to hear how the publishers came to be comics publishers in a round-about way, trying their hands at other ventures before settling on comics. 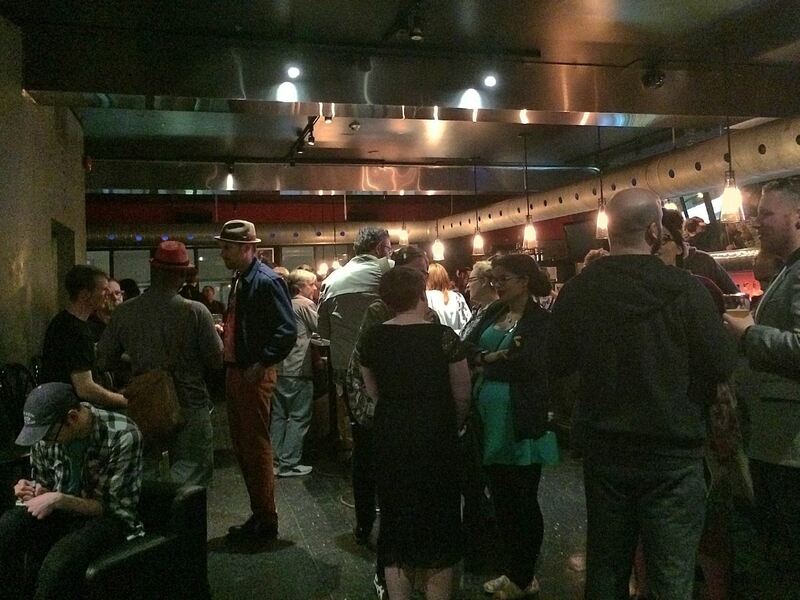 Friday ended at the TCAF 2016 Official Welcome Party at The Pilot bar. After a day of talks, it was great to hang out in an informal setting and meet some of the talented Canadian cartoonists, many of them also published by Conundrum Press (Meags Fitzgerald, Sean Karemaker, Joe Ollman, Billy Mavreas, Dakota McFadzean, Howard Chackowicz among others). I also met two awesome American artists who travelled from New York for the festival – Sara Wooley and Micheline Hess, who I hung out with over the festival. More raw vegetable platters and Steam Whistle beer, before heading back to the hotel to hit the sack. After one day in Toronto, I couldn’t help but notice that Canadians are some of the politest people on earth. Really, they go out of their way to be friendly. Folk open doors for you from five meters away. Drivers stop at intersections to let pedestrians cross the street. They take pride in showing how helpful they can be around these parts, and I love the attitude – I mean, it’s contagious, right? 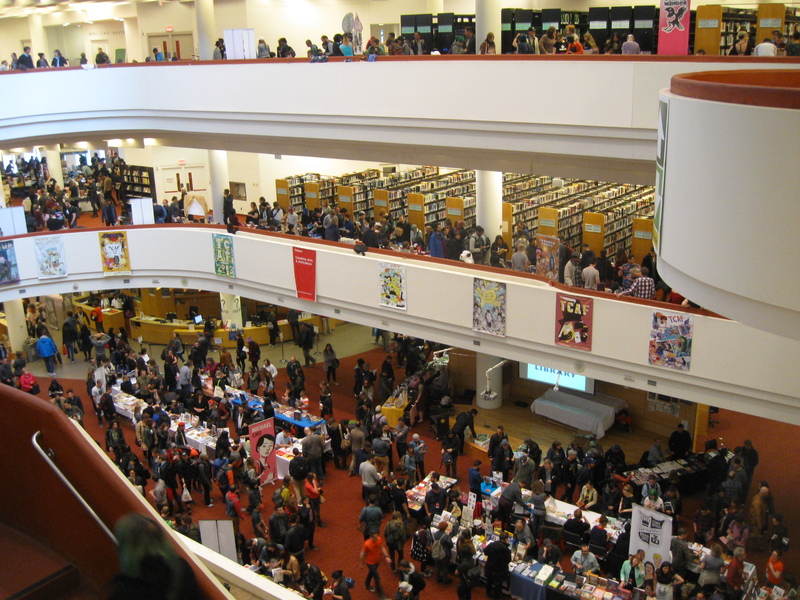 Saturday was the first day of TCAF, and Toronto laid it on with icy winds and hail. The day started with breakfast with Anders and one of my cartooning heroes, Seth. Seth was a huge surprise – warm, funny, gregarious – nothing like I imagined he’d be from reading his comics, and meeting him was a definite highlight of my trip. 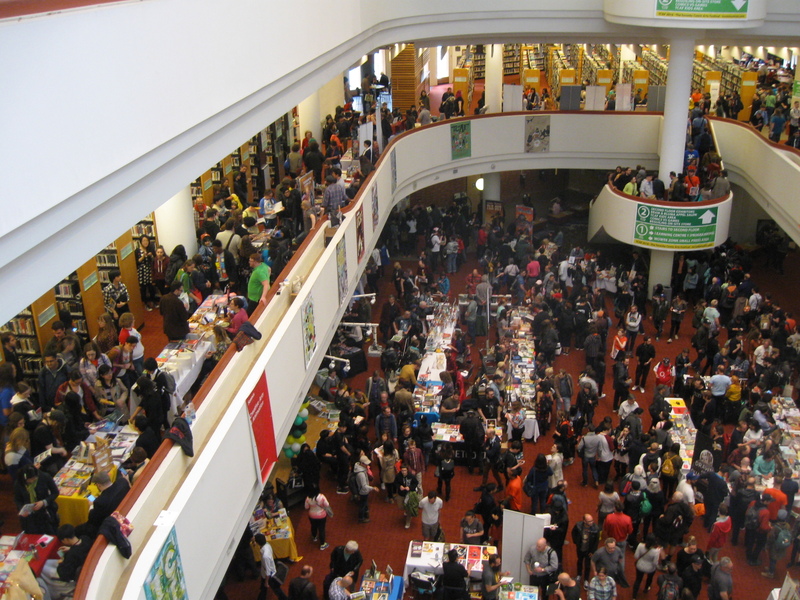 TCAF was held at the Toronto Public Library – an imposing building on the corner just around from the hotel. Entry was free to the public, and the event encompassed three floors of the library. 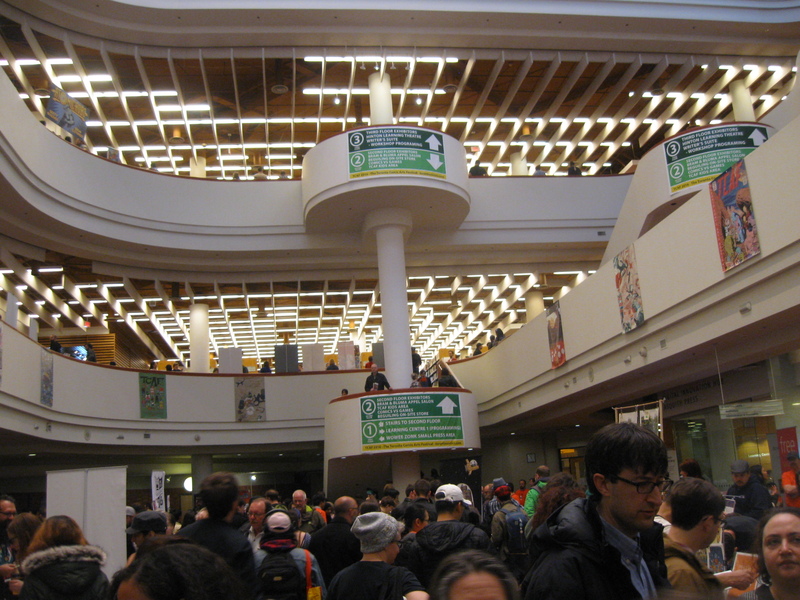 When I arrived, cheerful volunteers in bright orange TCAF t-shirts were everywhere, and the public were streaming into the building and milling about the exhibitor’s tables. 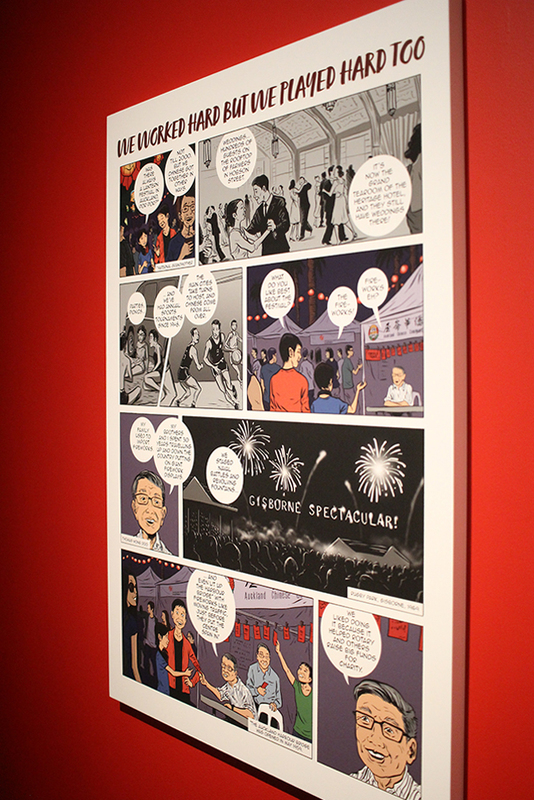 The variety and number of comics on display was amazing. And to think a festival focused on independent/alternative comics could gain this much support was an overwhelming and beautiful realisation. It really felt like I’d found my place and my community. 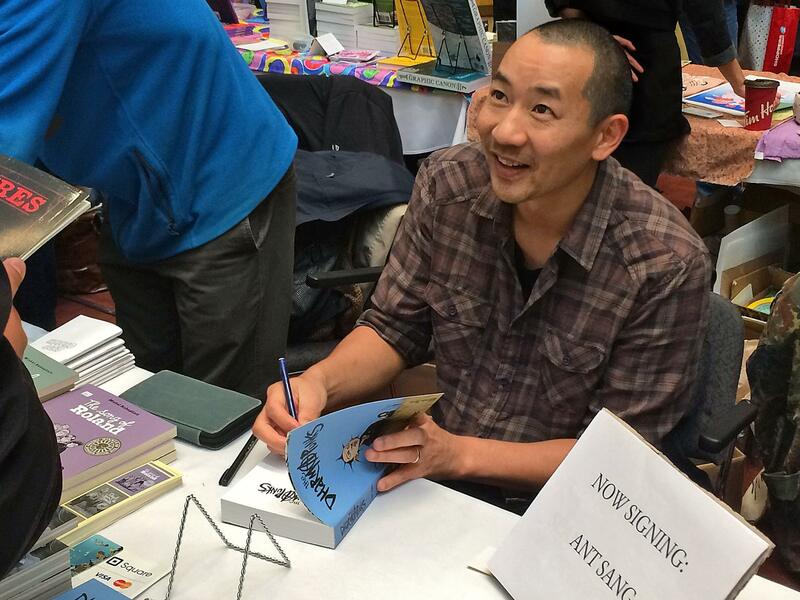 On Day 1 of TCAF I gave two talks. 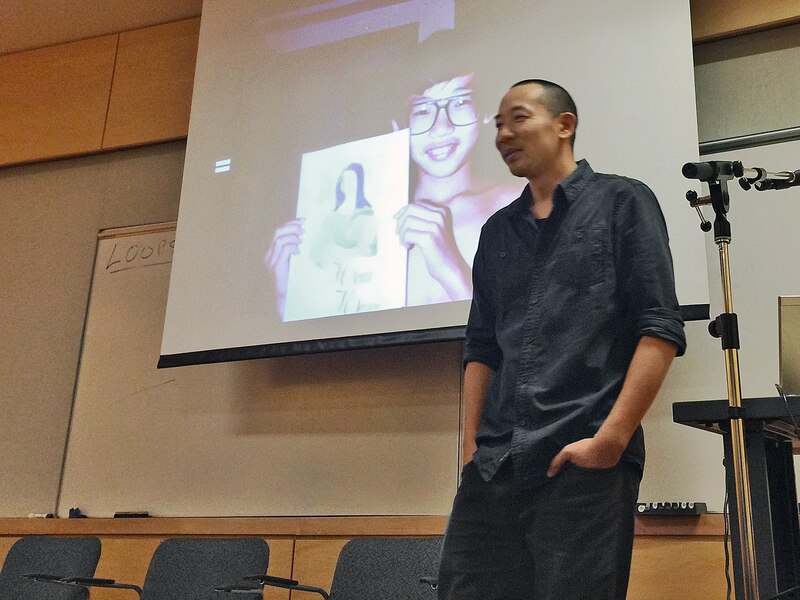 The first was a Spotlight talk, where I got to talk about myself and my work for an hour. The second was a workshop covering my work in comics and animation. I also had a well-attended signing session at the Conundrum Press table, and it was great meeting and chatting with people stopping by our table. 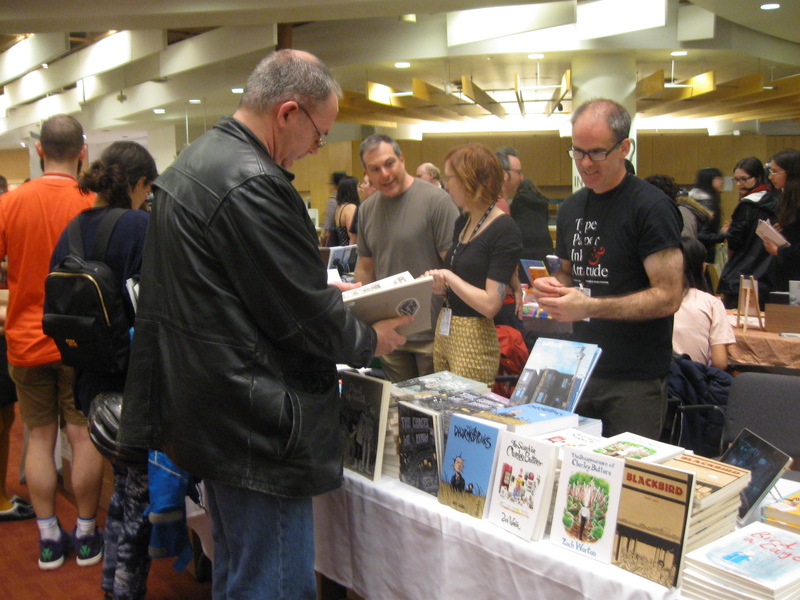 My book The Dharma Punks had been receiving quite a bit of word-of-mouth excitement around the festival and also some good press in the media, even getting chosen as one of CBC Books’ picks on their list of “15 Books to Check Out at TCAF”. I briefly checked out the Fantagraphics and Drawn & Quarterly tables and found myself face-to-face with Chester Brown. I asked if he was signing and he said he was. I thought I was in luck until someone at the table pointed to the queue which was quickly forming for his signing session. I said I’d be back and dashed to the end of the line. 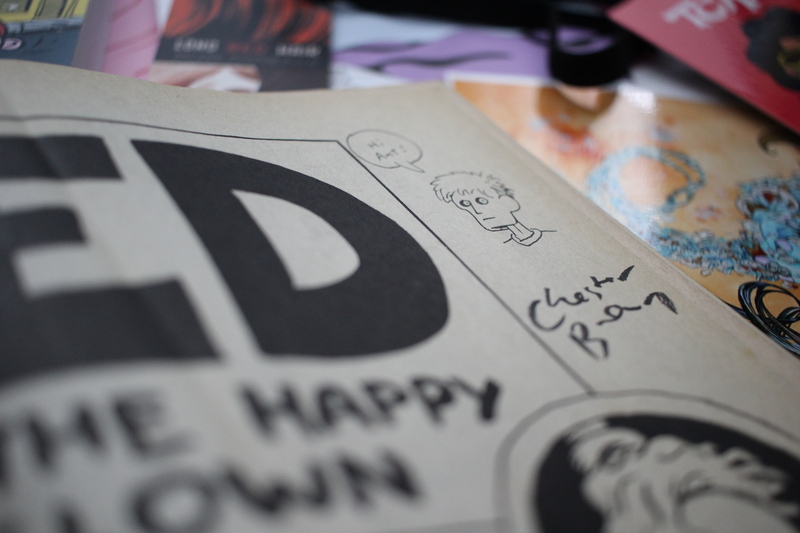 I stood in line for an hour, clutching my tattered copy of Ed the Happy Clown, which I’d carried thirty hours for this very reason – it was one of the comics which inspired me to start making comics in the mid-1990s, when I was deep in the throes of an existential crisis. The raw, wild comics of Chester Brown, Daniel Clowes, Julie Doucet, Joe Matt and others made me realise that anyone could make comics. These guys had something to say, and it didn’t matter if they weren’t perfectly drawn. In fact, they were better if they weren’t perfectly drawn. 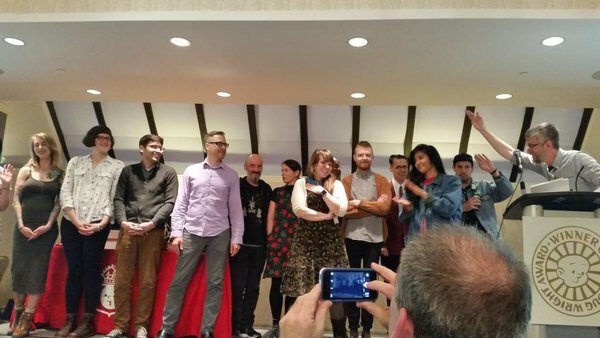 These were the comics and the artists who changed my life, and bloody hell – here I was amongst them. My meeting with Chester Brown was brief but great. “What kind of a name is that?” he asked as he sketched a deadpan face with bulging eyeballs inside my battered book. Next I attended a panel talk featuring Brian K. Vaughan and Pia Guerra (creators of Y: The Last Man), watched the (NZ-Canada co-production) film Turbo Kid, which was a hoot and attended the Doug Wright Awards 2016. The award ceremony was really interesting – like New Zealand’s (pretty much defunct, unfortunately) Eric Awards, but bigger. It was impossible not to make comparisons with our local version of the awards ceremony. Like the Eric Awards, the Doug Wright Awards are named in honour of a late, great cartoonist of an earlier era, and run by a not-for-profit team dedicated to promoting and celebrating the best comics published the previous year. And like New Zealand’s comic scene, the Canadian scene – though bigger by miles – still has many of the issues we New Zealanders face in terms of recognition and making a living from our comic books. Held in the Marriott Hotel ballroom, with a formal dress-code for speakers and nominees (unlike stragglers such as me), the ceremony had it all. Funny, articulate hosts. Speechless winners. And of course Seth’s intimate and moving tributes to local comics heroes Darwyn Cooke (who had passed away only that morning), and James Simpkins (1910 – 2004) who was inducted into the Giants of the North Hall of Fame that evening. There was very obvious comradery, respect and affection amongst the cartoonists and publishers at the awards, and it was a real honour to have attended. At post-award drinks in the hotel bar that night, Sara-from-NY said the TCAF crowd had a certain ‘don’t give a f*@k’ quality. More than nonchalance though, I thought there was a visible pride in being whoever the hell you are. Billy spluttered excitedly “I can’t wait to see them in forty years y’know!” The remnants of grunge still hung in the air in Toronto. I hadn’t seen so much green dyed hair, leather jackets and Doc Martens since 1994. And the line between hipster and nerd was so blurred I couldn’t tell who was which. My Sunday schedule was much less jam-packed. I was scheduled for a panel talk about “Diversity” later in the afternoon, followed by a signing at the Conundrum table, but until then I was free to roam. I nipped into a panel discussion titled “Comics vs Games on Twitch – Creative and Game Streams”. Nic ter Horst, Rosemary Brennan, Shawn Mcgrath and Rachel Kahn (moderated by Leisha-Marie Riddel) discussed the ups and downs of live streaming and maintaining an online presence. As I mentioned previously, I’m a techie-luddite, so any discussion like this is useful to me. Random notes I scribbled down: use Youstream, Livestream, Periscope, Twitch, Youtube and GoogleChat to stream; Posting/streaming online is like “shouting into a canyon, waiting for an echo”; tagging and hashtagging is your best friend; “Be funny. Don’t be boring”; regarding online personas, and whether you have one, one of the panellists replied “It’s just me but louder. More me”; “a regular time (for streaming) is really important”. And lastly, they recommended FaceCam, OBS and Premiere for video editing. All good stuff! Next I did the rounds of the exhibitor tables. I checked out some great horror comics by Japanese ‘manga master’ Shintaro Kago, but sadly his books were sold out so I could only skim through the sample copies on the table. The Koyama Press table was overflowing with fabulous looking comics. I bought a bunch of comics and met Annie Koyama – a wonderful, inspiring woman who became a comics publisher after surviving surgery for a life-threatening illness, leaving behind her career in film and advertising and raising funds through the stock market! Time was ticking so I hooved it to the “Diversity” panel discussion at the Marriott Hotel, which I was participating in alongside Karla Pacheco (Inspector Pancakes), Anne Ishii (Massive Goods), Cathy G. Johnson (Gorgeous), Gene Yang (Boxers & Saints), and Bill Campbell (Rosarium) . The panel was moderated by David Brothers (Image Comics) and he started the discussion by saying diversity in comics should be totally normal, so wanted to talk about what we do without discussing the ‘topic of diversity’, which was unexpected but cool – because really, what was there to say except “yeah, diversity is good”? 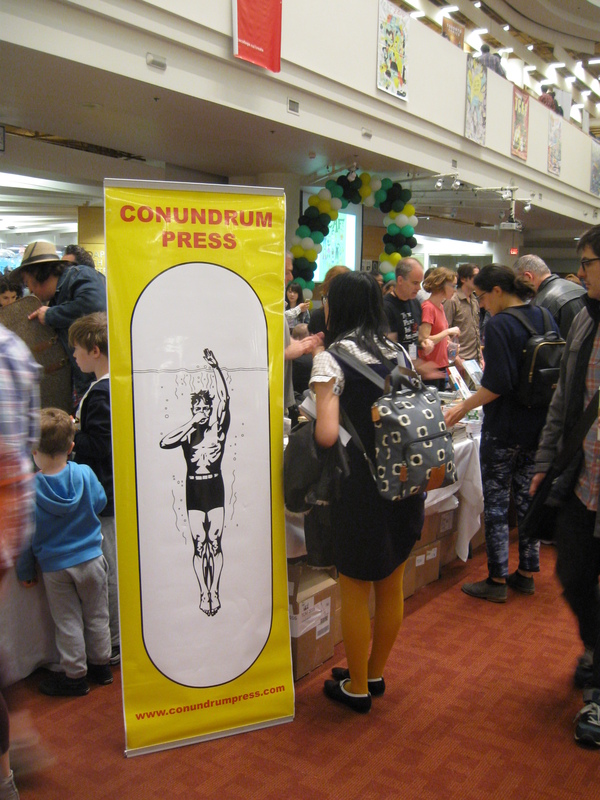 I did a final stint signing books at the Conundrum table as TCAF 2016 came to a close, and the last of the 22,000 attendees drifted from the venue. The Conundrum team packed up and we had a final meal together across the road at Lee Chen Asian Bistro. It was sad saying goodbye to my Conundrum friends, but good to know we have new friendships spanning across the Pacific Ocean. Later that night Sean and I took the subway a few blocks away and hung out at the TCAF Closing Party with some of the cool people we’d met throughout the weekend. But lack of sleep and jet lag had kicked in so I took off early back to Marriott HQ to get some much needed sleep. And that was it, the next day I was headed home to New Zealand. Twenty two years ago I started making DIY photocopied mini-comics, inspired by some of the cartoonists and publishers I had the pleasure of meeting at TCAF 2016. Over the years my artwork has become slicker as my influences have changed (James Harren, Paul Pope, Becky Cloonan are my latest faves), but coming to this festival and immersing myself in the alternative comics world makes me realise my heart really does lie with the more personal and idiosyncratic comics. I’m torn between (the stories and low-fi art-stylings of) indie comics and the slick artwork of my art heroes. Torn between wanting to write meaningful, personal stories and wanting to make a living from comics (hint: really hard to do with indie comics!) 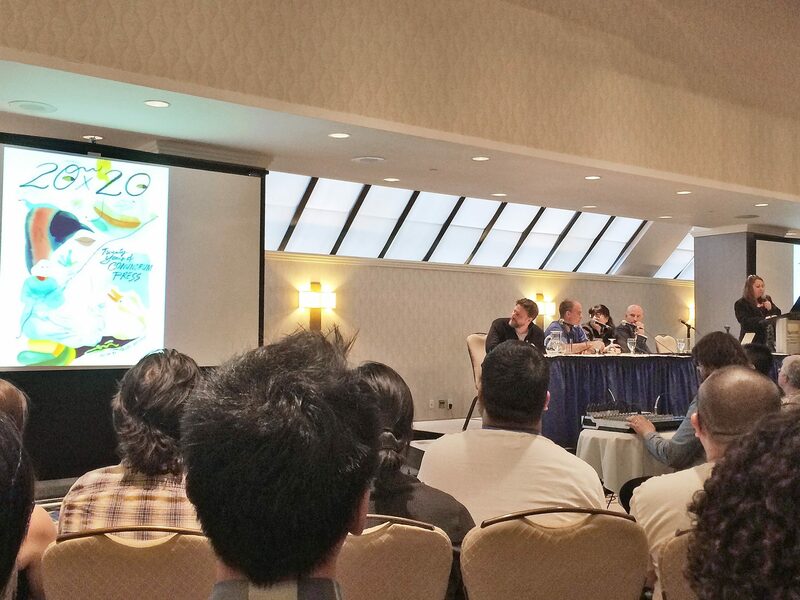 There aren’t any pat answers, but I come away from TCAF inspired to make great comics with big appeal – the best of both indie and mainstream comics – and I’m comforted by the knowledge that there is a vast audience for all kinds of comics. 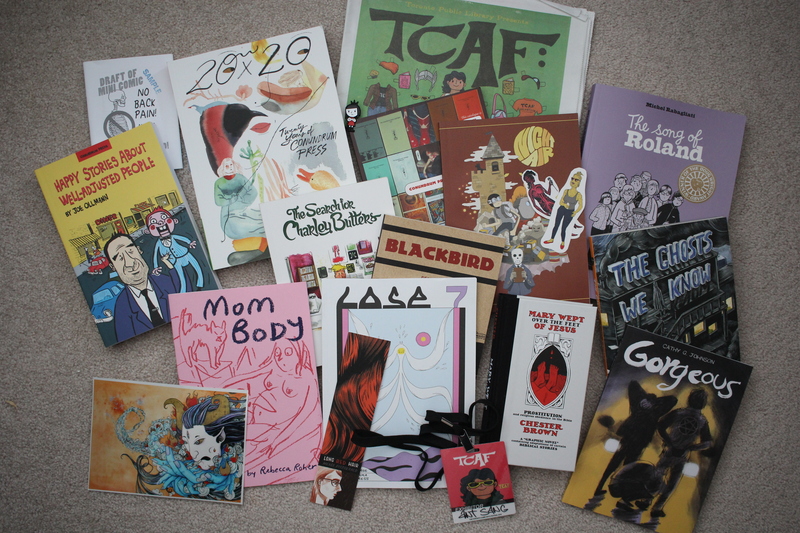 Many thanks to TCAF, The Beguiling, Conundrum Press and Creative New Zealand for making my trip to TCAF 2016 possible! I’m flying to Toronto this weekend for the excellent Toronto Comics Arts Festival. With nearly 200 talks, screenings, gallery shows, workshops and live drawing demonstrations, it’s going to be one hell of a weekend. Brought up in New Zealand and Hong Kong, Ant Sang’s work in comics, film, and animation evidences worlds of influences from anime and sci-fi to comic books and Shaw Brothers kung-fu films. 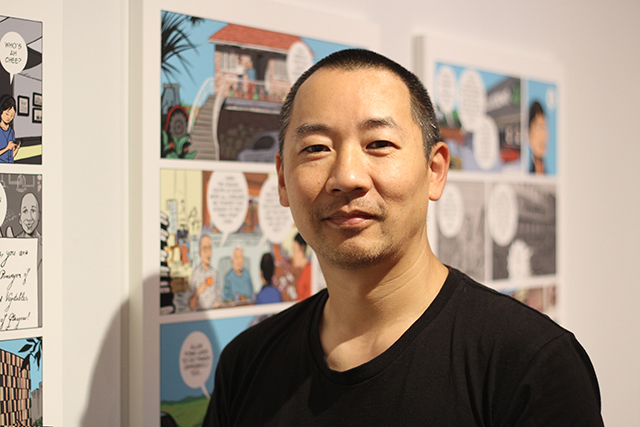 Inspired by the mid-90s alt-comix scene, he began creating and self-publishing his own comics, becoming one of New Zealand’s most respected graphic novelists! As part of Conundrum Press’ 20th Anniversary, Ant has travelled from New Zealand to present from his Conundrum-published work Dharma Punks, and discuss his long comics and animation career. 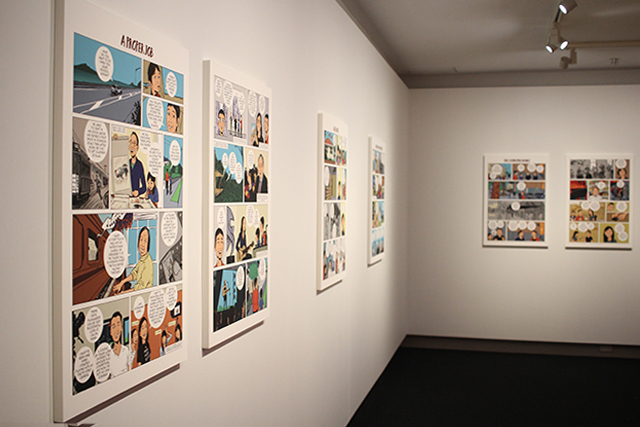 Description: New Zealand artist Ant Sang has been writing, drawing, and self-publishing comics for years. He’s also dividing his time between comics and writing and designing major animation projects, including the new film ‘notes to eternity’. In this workshop and discussion, Ant will talk about applying his comics skills to film and animation, and vice versa. It is unmistakable that the evolution of any medium is contingent on the inclusion of a healthy variety of different voices. Karla Pacheco (Inspector Pancakes), Anne Ishii (Massive Goods), Ant Sang (The Dharma Punks), Cathy G. Johnson (Gorgeous), Gene Yang (Boxers & Saints), and Bill Campbell (Rosarium) are some such forces changing the canon of what is considered comics. Learn strategies on how you can also take part, on all axes of identity, in this panel moderated by Image Comics’ David Brothers. Many thanks to Creative New Zealand for assisting with the trip. Hope to see you there! 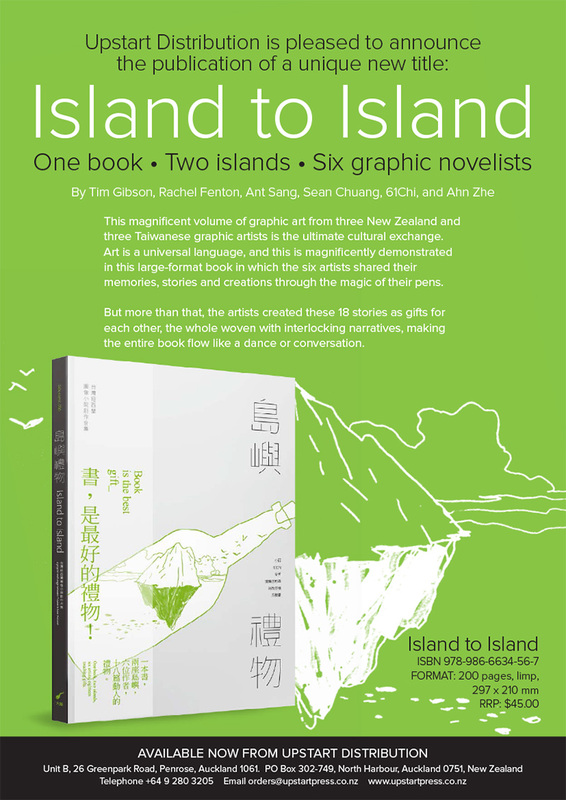 In 2014 – 2015 Ant was honoured to be one of six artists involved in a graphic novelist exchange between Taiwan and New Zealand. 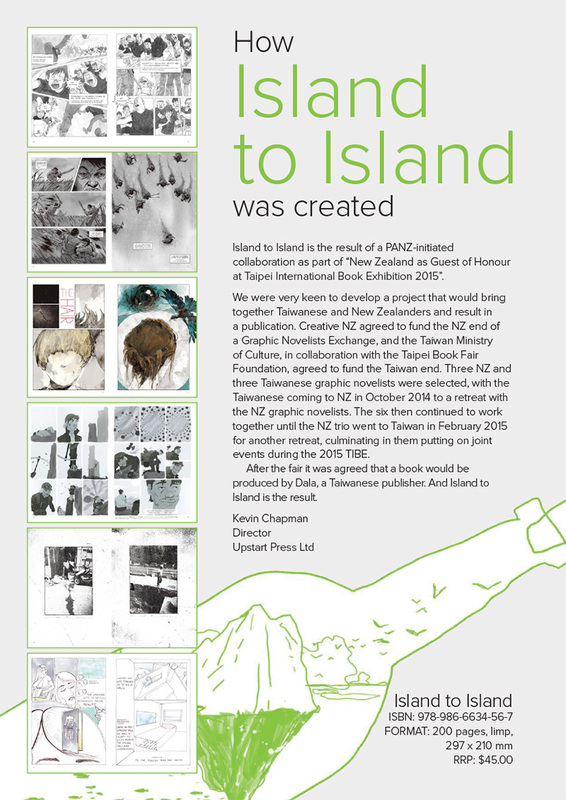 The resulting book Island to Island was launched at Taipei International Book Exhibition 2016 last month, and copies are now available here in New Zealand through Upstart Distribution. Check out their website to get yourself a copy!